We often talk about the importance of leadership in education, but what does it actually mean? Leadership is about leading others towards an imaginary future. It is not easy, because we don’t actually know what is there. But, by having sufficient knowledge and data, we can make educated guesses about it. Effective leadership in education is about engaging the whole team to improve educational outcomes – yes, this means including students into the improvement process, and engaging them in their own learning (not just schooling: see the previous blogpost). The other hard, but oh so important step in leadership is to move the focus and action from what is urgent to what is important. In classroom this means teaching and learning for life, not for test (this also can be seen as engaging in deep learning). For teachers and instructors the job description has (at least) three parts: leadership, management and coaching. A major part of my daily work is about my attempts to provide leadership and empower my students to step up on the plate and be in charge of their own learning and meaning-making. The managerial aspect of being a teacher (grading, disciplining, being the gatekeeper) is not as appealing to me, and in my current position I am very happy that the assessment department does the grading, and I can just coach and support my students to understand what their tasks entail. It is always important for students to interact with the content to get all the information provided about the topic of the lesson or unit, but an equally important thing is to engage in thinking, because otherwise the readings/lectures/videos only remain as information, they do not become knowledge. I really like the definition of information only becoming knowledge after it has been processed through our minds, because the individual interpretation of any given fact is what makes effective learning to happen. Leadership is very much needed in everyday classroom situations to empower students to learn what they need to learn, not what others in the classroom need to learn. One size doesn’t fit all and blanket statements are quite useless when the focus is in learning instead of teaching. This personalization, of course, is also the premise of differentiated instruction, but it actually takes the student even further on the road towards self-directed and self-regulated learning. Knowing what I know and what I need to learn is the foundation of engagement in independent learning. Leading each student forward on their path of individual learning process is what makes teaching so hard: all students have individual needs and should have personal goals in their learning, but setting and updating those goals would take a lot of teachers’ time. This is why it is so important to engage students in setting their own learning goals (within the classroom/curricular goals – or even beyond them, if the student is very advanced). The standards are an excellent tool for providing the descriptions of what good learning or good skill looks like. The next step on the path towards independent learning is providing opportunities for students to engage in self-assessment to “calibrate” their thinking about their own learning/skills to meet the view of curriculum designers. Imagine how effective learning is in classrooms like this – and how students are learning for life, not just for the next test! And imagine the ownership of learning students have! This is where the appropriate leadership takes education in the classroom. The questions of purpose, audience, the level of detail, feedback, etc. asked from curriculum writers are equally valid in the classroom practice, even if in a different scale. Effective teaching, or instruction, is about providing learning facilitation and leadership for students, so that they can feel empowered to engage in learning and meaning-making and have solid ownership for their learning. Collaborative meaning making is the best tool for engaging people in a dialogue. The shared vision of learning is the imaginary future; and real curriculum leadership, not just management is the way to get there. Unless students and teachers are buying into the district vision, it doesn’t really matter what the papers have written on them, or how beautifully crafted the mission and vision statements are. I wish we didn’t so exclusively connect the concept of learning with formal education and going to school or being a (college) student. Because learning actually happens everywhere, all the time. At school learning is just more focused and targeted to meet the standards or performance measures of the course. Maybe it is just me, thinking how being a learner only depends on your mindset? With a curious approach to life even reading your daily newspaper can become a learning experience, not to talk about diving into books…or the wonderful open source journals, databases, libraries… and wikipedia. Maybe I am addicted to learning, but I consider a great fun to hit the random article button in wikipedia and reading about something I maybe knew nothing about. Lifelong learning is so important in these times when there is more information available in our fingertips than ever before! Unfortunately many students are schooled out of their minds with too tight performance measures and learning objectives that leave very little or no space for wondering and creativity. How can we help students to become interested in learning, not just expecting to be schooled or pass a test? How to help more students to become lifelong learners? As a teacher and mentor I try to understand what is the mindset of my students, and I created the typology below to illustrate the four different types of students we have. Newman, R. S. (2008). The motivational role of adaptive help seeking in self-regulated learning. Motivation and self-regulated learning: Theory, research, and applications, 315-337. Zimmerman, B. J. (2002). Becoming a self-regulated learner: An overview.Theory into practice, 41(2), 64-70.
empowering students to become autonomous learners. When learning is seen as a product, the emphasis of the learning-teaching interaction is in instruction – and the thinking behind comes from the idea of students only learning when the teacher is instructing them, and only what they have been taught. The reality is different, as any curriculum leader can tell you. At any given moment of time any given classroom has several ongoing curricula: intended, written, taught, actualized, learned, etc., so we cannot simply look at the learning product. This product may be a paper, worksheet, notes, homework, essay, grade, etc., that we use to measure the results of students’ learning. Emphasizing learning products makes mistakes very undesirable phenomena in the classroom – after all a perfect product is the goal, right? And often the grade only reflects the finished learning product, without paying attention to how the student got there. Maybe s/he already knew the content or had the skill, and didn’t have to study or practice at all? If we pay too much attention to the product, we may miss the important part of the learning-teaching interaction: the individual students’ main gain, her/his increase in knowledge/understanding/skills that has happened as the result of instruction. Now, very seriously: which one is more important to you? What your students know/can do — or how much they improve in what they know/can do? Improving what students know/can do inevitably leads to different end results, because each student has her/his own starting point. And this improvement, the increase, of course, IS the result of the individual learning process of each student. This is also why helping students to become independent learners is so important. Independent learners tend to automatically (or by learned habits) engage in their own learning process. While observing these students we can see them intentionally influencing their own learning behaviours, and Bandura (2006, p.164-165) described the four following components in their engagement: the intentionality of their learning, the forethought of their actions, their self-reactiveness and self-reflectiveness. Of course, to be able to do all this, students must have certain amount of freedom in the classroom, which is why I am so fervently advocating for providing more choices in classrooms. Choosing is a skill that can (and should) be taught and learned, and it only grows when students have ample opportunities to try choosing in an emotionally safe learning environment, where mistakes are not only allowed but celebrated. Just imagine how much more these students learn! They don’t need the teacher to motivate or engage them, because they are already “in the zone”. In the classroom these components apply straightforwardly to students’ engagement as intentional learning activity, and learning motivation and goal-setting as their forethought. Meta-cognitive knowledge is about knowing and understanding how I learn, knowing what is easy and what is hard for me, and where do I need to put in extra effort in learning. Independent learners, who engage in their own learning process already know these things. Wouldn’t it be important to help every student to possess this knowledge of themselves? The third component in independent learning, self-reactiveness, relates to the way students control their own learning actions and regulate their own behaviour in classroom. As a teacher it is important for me to ask myself, how can I support my students’ self-regulation and provide more autonomy for them. When students get to regulate their own learning process (pace, depth, breaks, note-taking, collaboration, additional information, etc) also the learning results, the visible and tangible products of learning, do improve. Maybe the easiest way to support students’ learning process is to provide accurate and timely feedback. This strengthens the fourth component of independent learning, student self-reflection, which is too often overlooked. Feedback has been statistically identified as one of the important teaching-learning factors (Hattie & Timperley, 2007), because it enhances both the learning process and the product we get as an end result of successful learning. Students self-evaluation is an important classroom practice, because it combines feedback and self-reflection. To me it seems that too strong focus on the learning product leads to shallow learning (to just get by), and strategic learners (to just get a good grade) instead of deep learning. 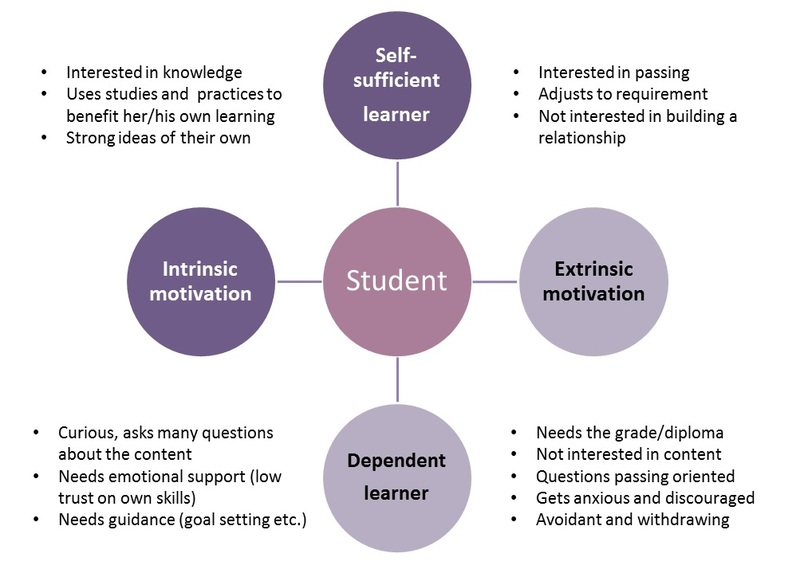 While independent students may have strategies to cope in product centered learning environment, the dependent students may not have a clue what they should do, or how they are supposed to do it – which further decreases their learning motivation. Focusing on the learning process emphasizes the students’ responsibility in the learning-teaching interaction. It both enables and encourages students to engage in their own learning. This engagement helps both students and teachers to build learning up from standards and to achieve competencies needed in our modern world. Bandura, A. (2006). Toward a psychology of human agency. Perspectives on psychological science, 1(2), 164-180. Have you noticed how there are people who seem to “happen to the world” and others who have the “world happen to them”? People who are proactive and engaged, and others who are passive and alienated? People who happen to the world are the ones who make their own choices about their lives, learning and everything. Isn’t that how things should be? People being active and make decisions about their future, and shaping their own thinking. How about people with the passive approach to life, people who let the world happen to them? What is their learning like? Psychologists use the term “locus of control” to describe whether people believe that they can control the items and actions of their own lives. Intrinsic control means that I am responsible for my own life. Extrinsic control means that someone else decides for me, and I need those others to come and save me from hard situations. But, it also means that my achievements are controlled by external factors concentrated to explanations like “It’s about luck”, “This is too hard”, and “I don’t know xyz”- the last one being super funny as there is more information at the reach of our fingertips than ever before. And after teaching for a few years you have pretty much heard them all. My favourite one is: “S/he made me do it”. Really? Did s/he now? And how, exactly? Why this long intro, you may ask. Well, so much of our academic success depends on what we believe about ourselves and education, and the interactions of the two. Life and learning cannot (and shouldn’t) be separated from each other. Simply measuring up to a performance standard, or creating a product (essay, project, worksheet, etc.) asked by the teacher shouldn’t be the end result of learning. Outcomes should be seen as a new configuration of students’ own knowledge, instead of superficial external measures. This is the real problem in education: teaching is so disconnected from learning. In the U.S. we invest more funds in education per pupil than many other OECD countries, yet the learning results are not improving. In a way it doesn’t surprise me because the fundamental idea of education is not matching reality. When teaching is seen as is simple as imparting or transmitting teachers’ knowledge into students, or imposing the teachers’ worldview into them, then one could easily argue how creating more standards or paying big money for additional testing is the solution for the underachievement problem. But information sharing is not teaching! Learning must be active and meaningful for students! When learning is understood as students internally constructing their own knowledge and effectively using it in problem solving and to support their learning process, then learning and teaching are certainly something more than just information sharing. Students’ academic performance derives from their learning, right? And students’ learning depends on their academic self-concept, which consists their motivation (intrinsic and/or extrinsic) as well as engagement, and also their own beliefs about their competence as learners. Understanding how students create their mindsets and beliefs about intelligence is important, and the research shows how ” there is more support for an effect of academic self-concept on achievement than vice versa” . Do we believe in fixed intelligence as static and unchanging, based on inherited qualities like gift or talent (Mindset concept by Carol Dweck)? Or, do we view intelligence with a growth mindset, which understands the developing nature of it, and emphasized how everyone can learn? Researchers strongly recommend the latter one: “Encouraging a malleable (growth) mindset helps to sustain children’s intrinsic motivation, thereby enhancing both academic success and life-long learning”. I think it is also very clear that only by empowering students to be active participants in their own learning and providing choices, we can create the culture of being responsible of our own lives and learning. 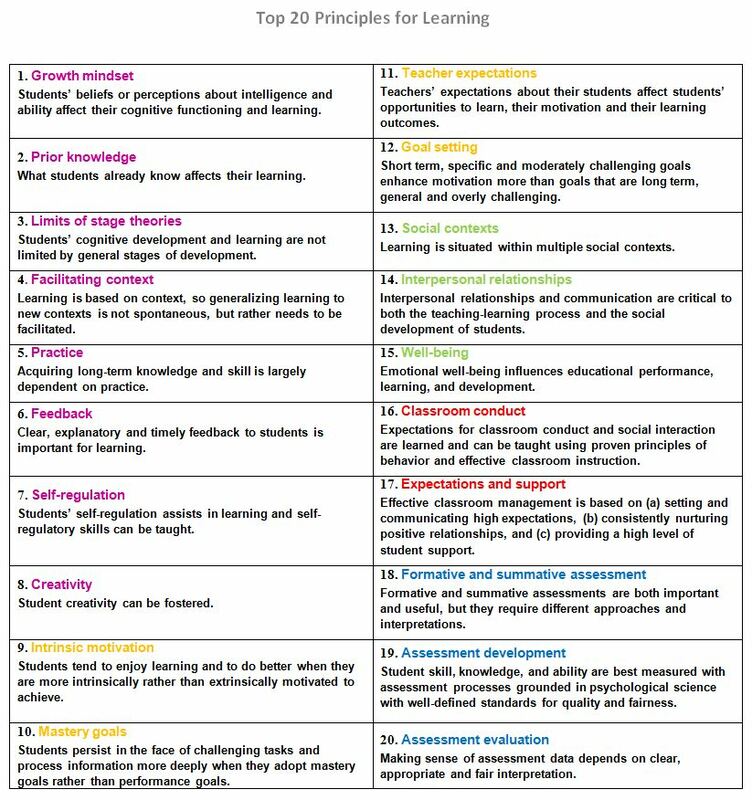 So, what can we all as adults – parents and teachers – do to foster this academic competence in every student? Bossaert, G., Doumen, S., Buyse, E. & Verschueren, K. (2011). Predicting children’s academic achievement after the transition to first grade: A two-year longitudinal study. Journal of Applied Developmental Psychology. 32, 47-57.